Description: Solaray® Serrapeptase provides nutritive support for healthy sinuses and inflammation in the body. It is a non-animal, proteolytic enzyme derived from a controlled fermentation of the bacterial strain Serratia spp. Each capsule is enteric coated, which helps it survive the stomach acid and pass into the small intestine. Directions: Use only as directed. Take one vegetarian capsule up to three times daily on an empty stomach. Store in a cool, dry place. Other Ingredients: Rice Flour, Vegetable Cellulose Capsule, Cellulose, Glycerol Triacetate, Maltodextrin, Magnesium Stearate and Silica. Inflammation of the paranasal sinuses can be utterly uncomfortable and painful for those who suffer this condition, this article serves to enlighten you on how the action of serrapeptase against sinusitis works. In the U.S. alone, there are about 24 million cases of sinusitis that occur annually. Symptoms of sinusitis can leave a person unable to do activities of daily living. Inflammation from the paranasal sinuses can cause headache and facial pain, adding up to this is the uncomfortable feeling of having a congested nose and constant lacrimation. Although sinusitis can be managed by medications and nasal irrigations, an emerging treatment is becoming a sound name in the medical field; here is where serrapeptase takes the spot light. Serrapeptase is a proteolytic enzyme that isolated from Enterobacterium Serratia sp. E-15. 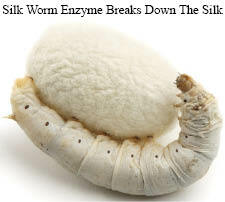 Serrapeptase is produced by this bacteria found in the large intestine of silkworms. This enzyme allows them to emerge from their cocoons and complete their lifecycle as an adult moth. Serrapeptase is claimed to have multiple health benefits, and certain studies have shown these effects in both animal and human subjects. So how can this enzyme be a potential treatment to sinusitis? Let us first take a look on its nature and course of action. Serrapeptase is a proteolytic enzyme, which means these enzymes act to breakdown proteins into smaller molecules. It is claimed to exert significant effects to managing pain and inflammation. Sinusitis is considered as an inflammatory disease at it is characterized by the inflammation of the paranasal sinuses. The inflammatory process involved in this condition includes the production of excessive nasal discharges (rhinorrhea). These discharges often clog the ducts responsible for a normal flow of fluids, thereby causing the sinuses to be enlarged. These nasal discharges are comprised of unorganized chains of proteins, which in some instances have tight bonds making the discharge copious. A copious discharge cannot easily flow through the ducts, so expelling them is not easy. This is where the action of this enzyme takes place, it breaks down the protein bonds of the discharges, making them less copious, and making them flow easily through the nasal passage way. The breakdown of these protein bonds prevent these discharges from clogging the ducts allowing them to be easily expelled from the nasal pathway providing a relief from the congestion. Theoretically, this is how the enzyme works in relation to sinusitis, studies done to gather evidences on the effectivity of this proteolytic enzyme had also been done. Certain studies affirm the affectivity of serrapeptase when it comes to treatment of inflammatory diseases such as sinusitis. The use of medications such as Nicolase (serrapeptase) is proof of the potency of the enzyme. Although Nicolase, is used to the treatment of pharyngitis, it may still well affirm its action towards inflammation. Pharyngitis also involves release of mucous discharges due to the inflammatory process, the enzyme have the same action of breaking this disorganized and tight packed protein to facilitate expectoration if congestion is present. Still, ongoing researches are done to establish the effectiveness of serrapeptase when it comes to managing sinusitis. Consulting your physician about this matter is one of the best steps you can take. I have been struggling with chronic sinus problems most of my life. After reading about serrapeptase, I decided to try it, what do I have to loose? After three weeks at two capsules each day i have noticed a significant decrease in congestion in the nose making it easier for me to breath. I did not even realize this product was working till one day my husband said something about how often i go for the tissue box. He said I do not have a tissue box right next to me while watching TV like I use to. So for me this product is great and I would recommend it to anybody who has chronic sinus problems! I have had severe back pain for over 10 years after lifting a patient. I was given a bottle of Serrapeptase by a friend and after taking just one pill, I woke up the next morning without the severe back pain. I was very skeptical at first and thought, "There is no way this is working", but after having now completed an entire bottle, I ordered 10 bottles and gave them to family and friends. I can't imagine going back to living on Ibuprofen. I can tell when I miss taking it for a day because I will have the pain again. You must make sure the product is enterically coated no matter what strength you purchase. I highly recommend giving it a try.